This page has been updated for the upcoming 2018 “Creative Planned Color Pooling” class scheduled for Saturday, July 28 in Portland, Oregon. 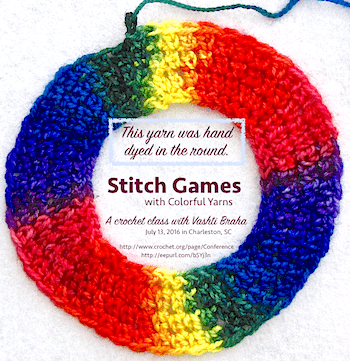 Clickable resources for my 2016 Crochet Stitch Games with Colorful Yarns class. Includes patterns for designs shown, and inspiration for new games. Also articles & books recommended in class. Download Jempool Color Stacks 101. Download Crochet to the Colors Playbook (3 pattern set). See the free Java Jammie pattern in the Berroco yarn company’s archives. Looking for a different pattern? See all stitch game designs that are not yet published at this self-updating Ravelry link. Karla Stuebing’s 2013 article, “Art and Science of Planned Pooling.” It’s about knitting but very inspiring for crochet.